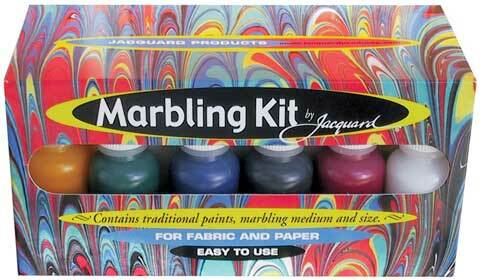 This marbling kit for paper and fabric contains six .5 oz. colors (black, blue, green, red, yellow and white), Methocel marbling medium, Alum sizing and complete instructions. The kit is designed for professionals, yet easy enough to use for beginners and makes a great group activity. Marbled paper is a tradition in bookbinding. Each piece will be as unique as a fingerprint.